The word Gagan means sky and Mahal is palace or mansion. Going by its name, its a palace high above the ground. The palace's elevation has an immense arch flanked by equally high but narrow arches. The ground floor of the palace was the Dubar hall. It has a platform from where the king used to address the court. 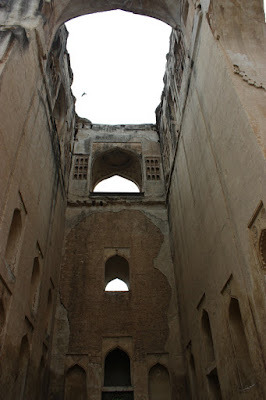 On the upper level of the building were the galleries and residential quarters. The upper floor was said to be supported by wooden beams and pillars. However, today the building is a roofless structure, devoid of the decorations - what we see today is the skeleton remains of the palace. 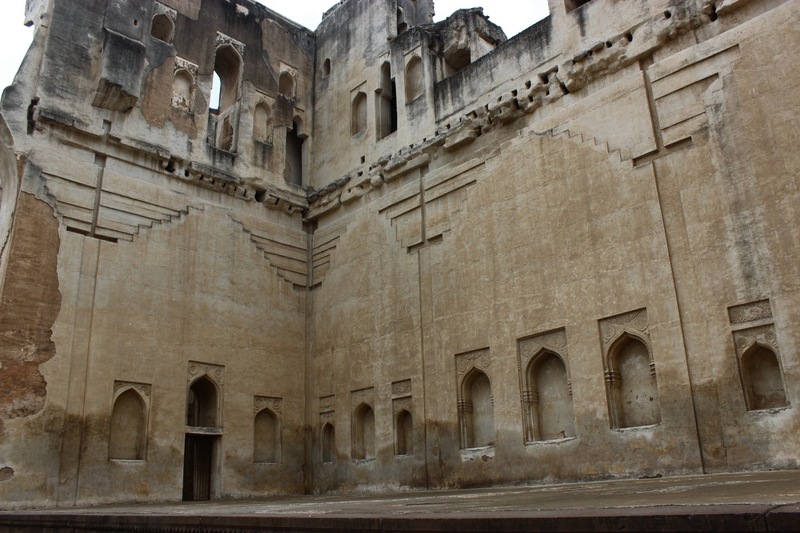 Gagan Mahal is said to be built in 1561 CE by Adil Shah I. This palace is said to have witnessed important events of the kingdom. QuenChand Bibi is said to have controlled the state's affairs from here. 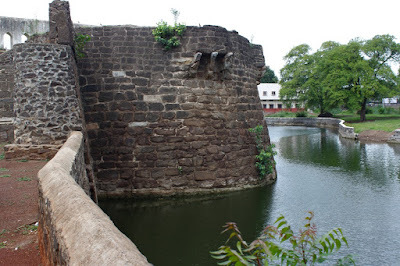 And the traitor Kishawar Khan had dragged the noble queen from here and sent to Satara for imprisonment. Later in 1686, when Moghul emperor Aurangzeb conquered the city, the last Adil Shahi ruler Sikander Shah was brought in chains to pay allegiance to the conqueror. After this incident, the palace is said have become silent.. deserted. 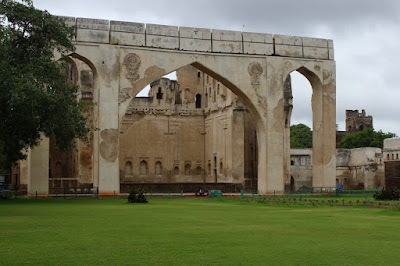 View of the arches from the Durbar platform. The Durdar hall walls. The lintel level of the ground floor is seen, its about 25 above the floor level. Seems like the upper floor was made of wooden planks, supported by wooden beams and columns. The stairway to the upper floor is concealed within these thick walls. 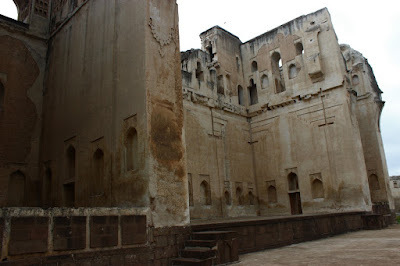 This is one of the smaller halls flanking the Durbar hall. Probably private meetings were held here. Gagan Mahal is situated right besides the fort wall and moat. The moat not only provided security but also supplied water to the palace. I wonder how water was supplied to the upper floors of the palace. We must've spent around 30 minutes at this 460 years old monument. It was worth the time. 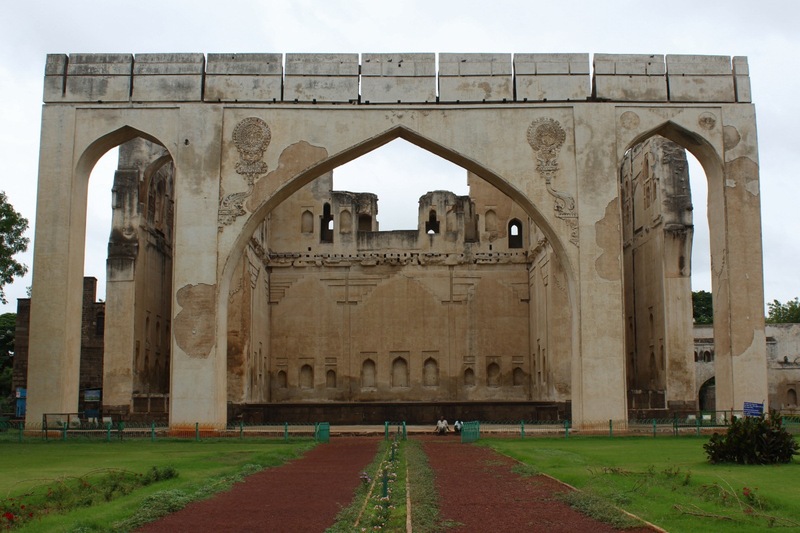 If you are touring Bijapur, I guess Gagan Mahal is one of the places where one can take a short break. 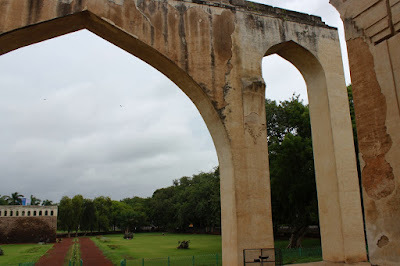 In the vicinity, in fact on the same street are two other monuments - Anand Mahal and the ancient church of Bujapur.